When the 2016 CFL schedule was released in February, the Hamilton Tiger-Cats announced that the Labour Day Classic will be moving to prime time as part of their plans to deliver a day-long experience for fans to celebrate the league’s marquee regular season game. The team confirmed those details Tuesday with the unveiling of WeatherTech Football Day in Hamilton. WeatherTech Football Day in Hamilton will deliver a double-header with the Hamilton Tiger-Cats and the McMaster Marauders bookending a day-long celebration with matchups against each team’s Toronto rival. In between games, fans will be treated to a free admission and Hamilton-artist-lead concert in the South Plaza. The free concert event will be delivered by the producers of Supercrawl, Hamilton’s largest annual music and arts festival and the 2015 Ontario Tourism Event of the Year. The day will culminate in prime time when the Tiger-Cats and Toronto Argonauts renew the oldest rivalry in professional sports. Throughout the day, the CFL on TSN panel will broadcast live from Tim Hortons Field for the first time ever. The CFL on TSN Mark’s Labour Day Weekend broadcast from the South Plaza will include pre-game, halftime and between game coverage for both Labour Day CFL games from Calgary and Hamilton. “The Tiger-Cats are proud to partner with WeatherTech, McMaster, Supercrawl and TSN in this celebration of Hamilton and football. The spirit of WeatherTech Football Day in Hamilton is to unite sports fans in our community, to share our love for the game and our City, and to deliver the ultimate experience for our fans,” said Matt Afinec, Chief Commercial Officer of the Tiger-Cats. Following the Marauders game, fans will exit the stadium to enjoy a free admission concert, delivered by Supercrawl, in the South Plaza. The concert will feature multiple acts to be announced in the coming months. The South Plaza at Tim Hortons Field is a fully licensed area, and food and drink will be available for purchase between games. Stadium gates will reopen at 5 p.m. with the annual Labour Day Classic matchup featuring the Tiger-Cats and Argonauts kicking off at 6:30 p.m.
Tiger-Cats season seat holders have presale access starting today to the best seats at the best price for the McMaster – University of Toronto game. All McMaster game tickets for Tiger-Cats season seat holders will be $15 including taxes and fees (a 25% savings off the $20 general public price). Season seat holders are encouraged to act quickly to reserve their tickets as only the east stands will be available for the McMaster game. To reserve tickets, season seat holders can go to www.ticats.ca/FootballDay and enter their Name, MyTix Account ID#, and number of tickets to be reserved or by calling 905-547-2287. For all other fans that would like to secure their tickets to both WeatherTech Football Day in Hamilton games in advance of the public on-sale date, Hamilton Tiger-Cats Flex Packs are now available. The McMaster game is included in the Labour Day Classic ticket price for all flex packs, group tickets and single-game tickets. Hamilton Tiger-Cats season seats, flex packs and group tickets are available online at www.ticats.ca/tickets or by calling 905-547-2287. Single game Labour Day Classic tickets go on sale to the general public as part of the CFL-wide single game ticket launch on June 1. 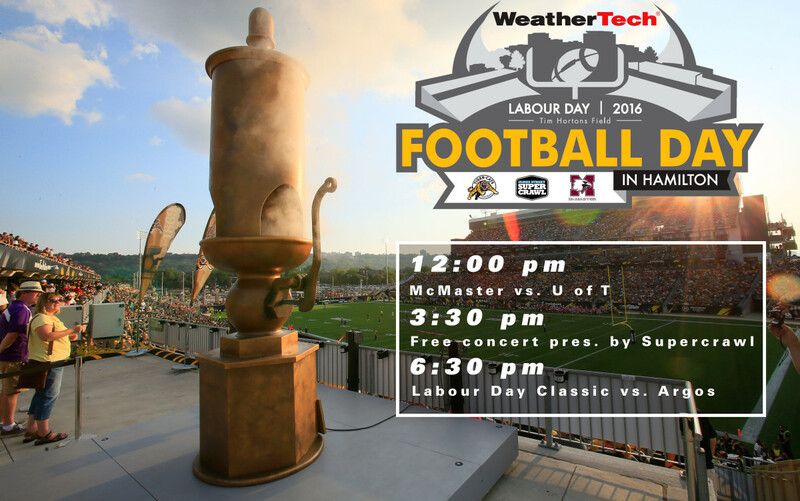 For McMaster season seat holders, tickets for the WeatherTech Football Day in Hamilton game at Tim Hortons Field are included in the 2016 McMaster season seat package.